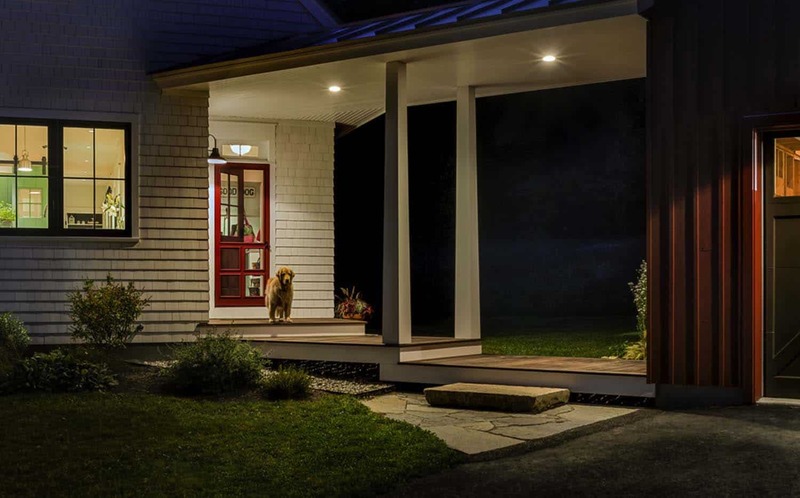 Whitten Architects designed this inviting farmhouse for a couple of empty nesters and their golden retriever, located on a picturesque field in Portland, Maine. 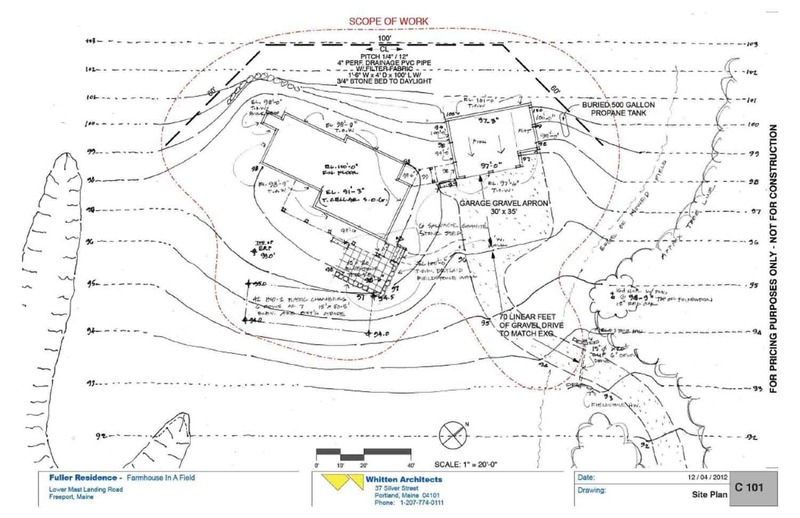 The project began with a field, a plot of land on a quite road that meanders all the way to the water. 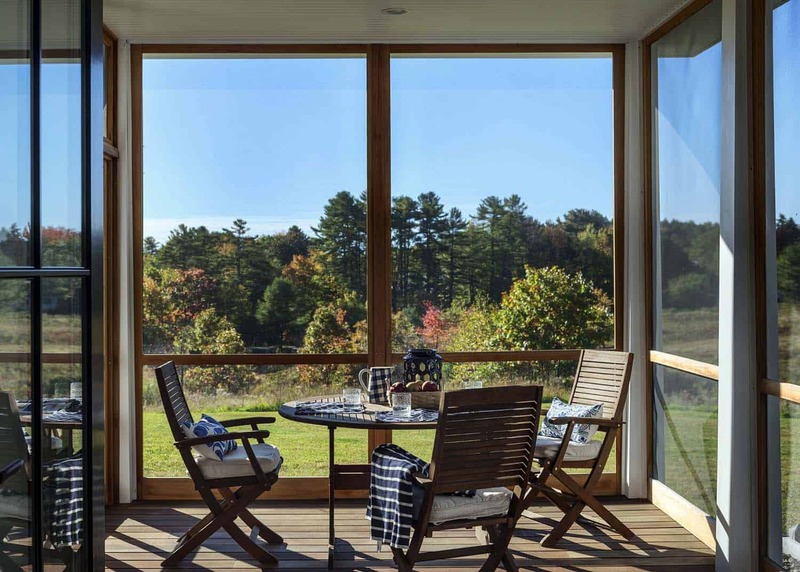 Surrounded by an idyllic setting, the vision was a modestly-sized modern farmhouse inspired by New England vernacular architecture. 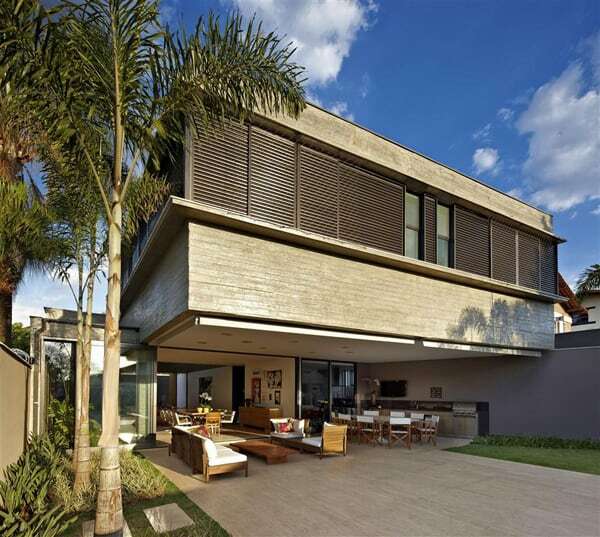 A strict budget led the architect to devise a plan that called for exposing the interiors to natural light and nature. 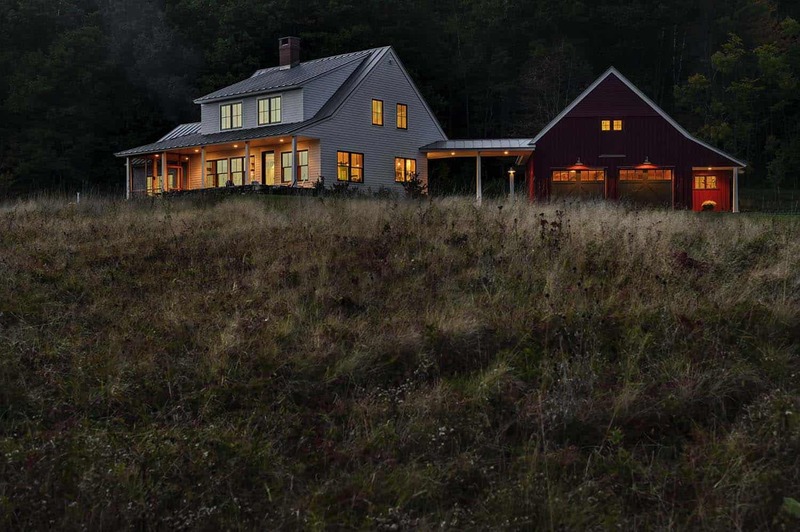 A site-specific design solution nestled the dwelling in an elevated northeast corner of the field, offering sweeping views of the property and beyond to distant coastal views. This placement, along with purposefully siting the driveway in the adjoining woods, allows the field to remain largely undisturbed. 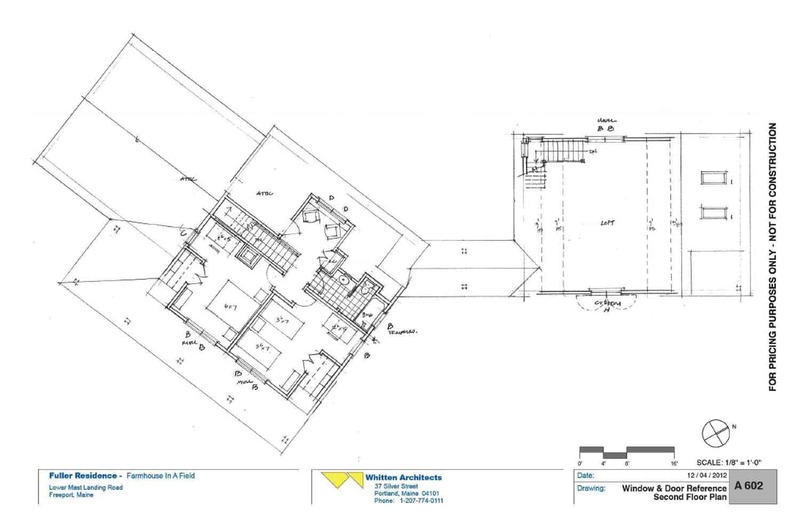 The floor plan calls for 2,546 square feet of living space with three bedrooms and two-and-a-half bathrooms. There is also separate 2-1/2 car barn / garage. 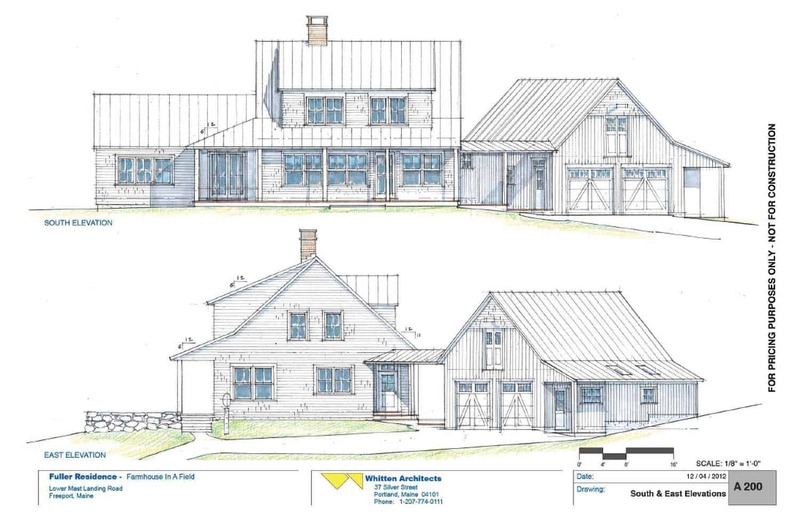 The homeowner’s down-sized from the previous residence, where their new farmhouse provides for mainly single-level living. 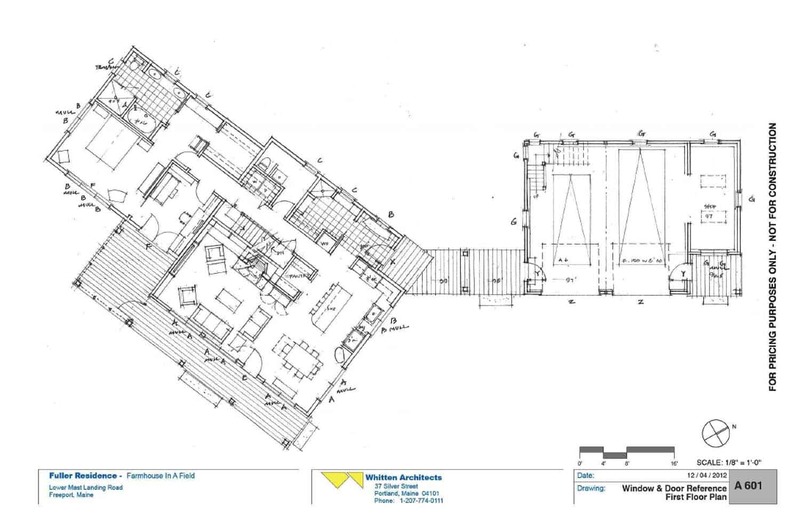 First-floor spaces were arranged to take advantage of the solar exposure that is naturally offered by the field and the home’s positioning on the site. 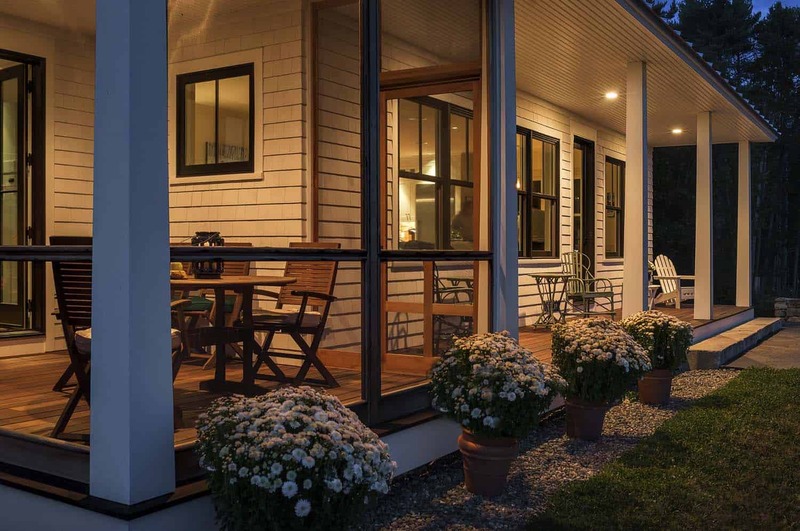 Solar calculated overhangs on the south-facing front porch provides shade in the summer, yet does not block solar gain during the winter. During the afternoon, the couple can enjoy late day sun and brilliant sunsets over the field via the southwest facing screen porch. 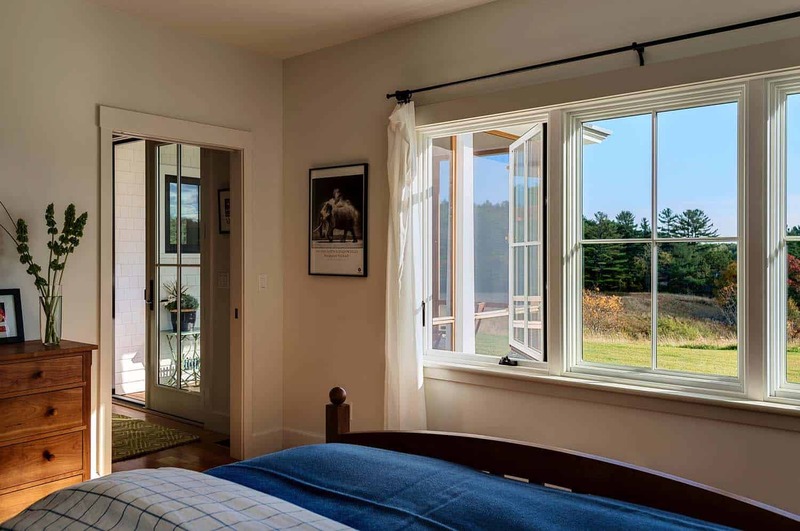 Double-doors directly connects a small home office and the master bedroom suite to the screen porch and landscape beyond. 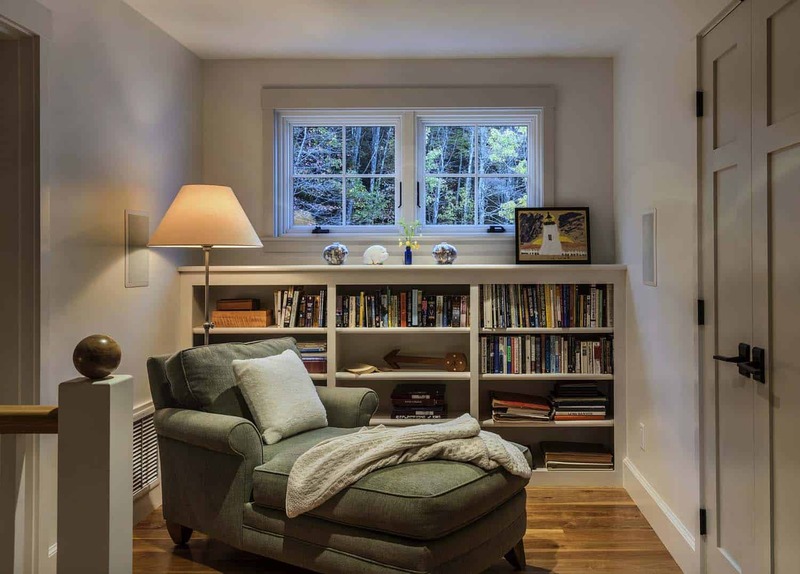 Less commonly occupied guest bedrooms and a cozy reading nook are located on the second-floor. From the windows of these spaces, one is afforded a wonderful perch for observing the active birdlife surrounding the home. Above: The siding is painted in two different colors. The white is Maibec’s standard “white” while the red is their “barnstable red”. 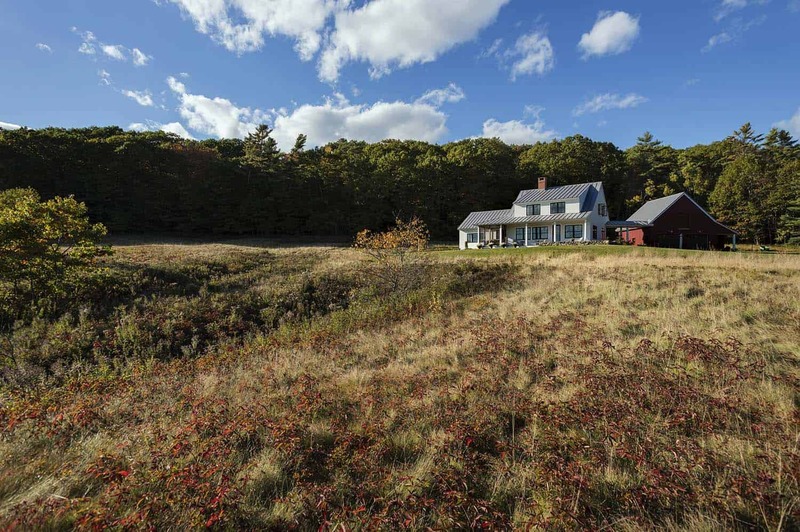 Well-established trees surrounding the inviting farmhouse provides shelter from winter’s prevailing winds. 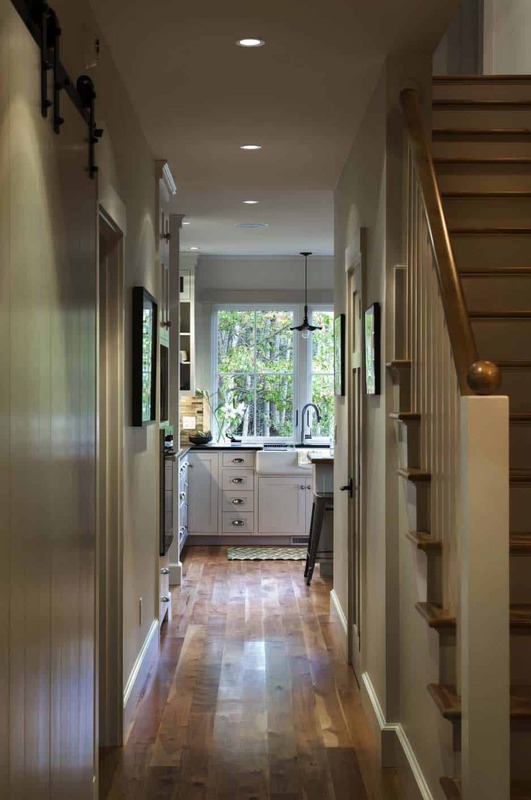 Above: An open breezeway connects the garage to the house, shielding the homeowners from the elements. 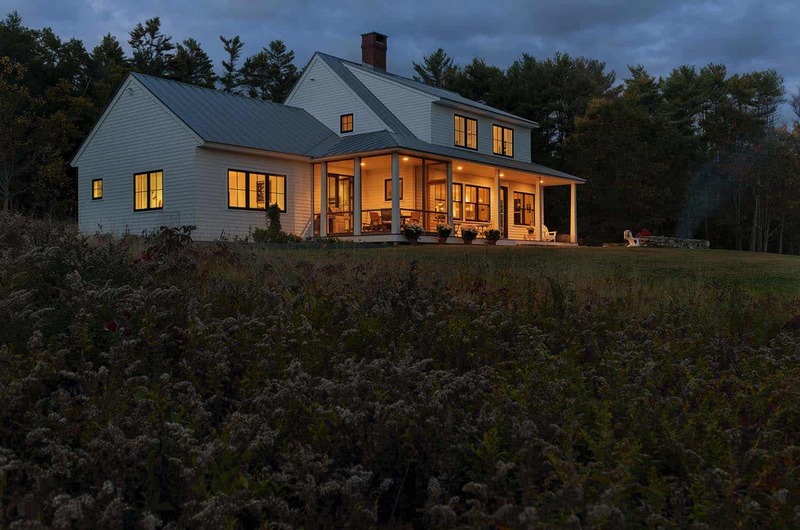 Conserving money and energy, this home features a geothermal heating system from Evergreen GeoThermal. It also boasts radiant floor heating and a closed cell spray foam insulation. 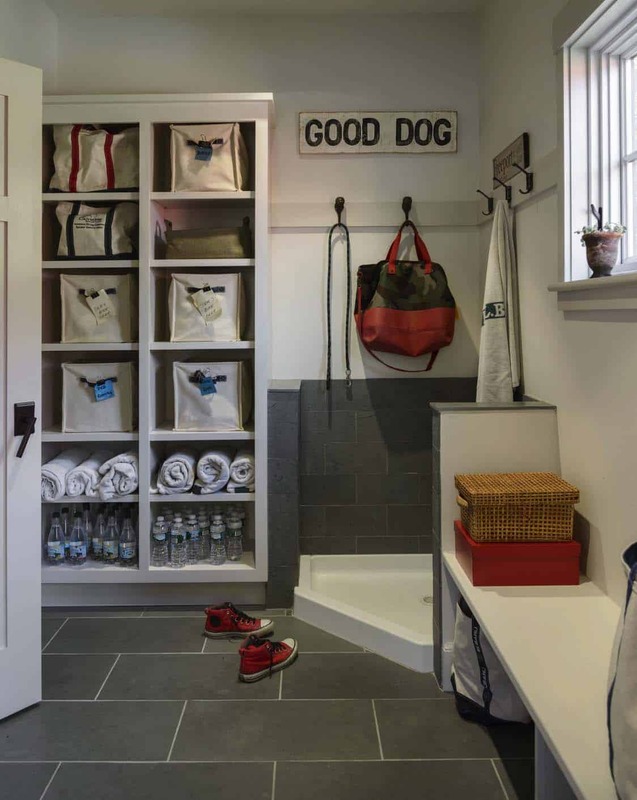 Above: In the mudroom, a dog-washing station is ideal for the couple’s beloved retriever. The flooring is honed Maine slate. Built-in cubbies provides storage space for essentials, with totes from L.L. Bean. A built-in bench helps with putting on shoes. 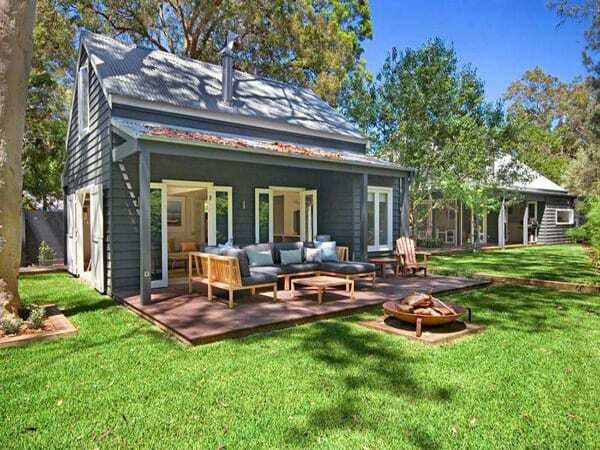 What We Love: This inviting farmhouse offers charming character, plenty of warmth and is so livable. 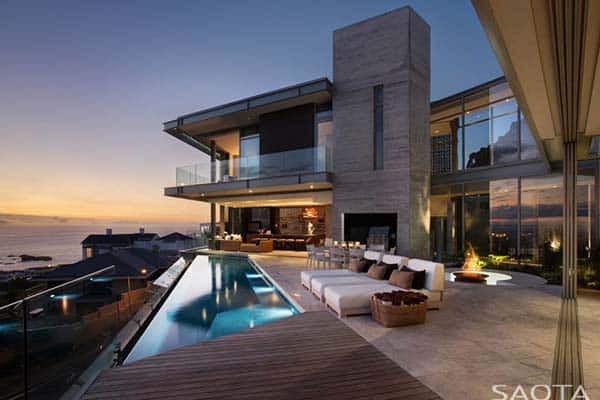 We love how the home does not try to compete with the beauty of the land — but welcomes it in. We could just imagine sitting in the screened-in porch and watching wildlife while enjoying a hot beverage. 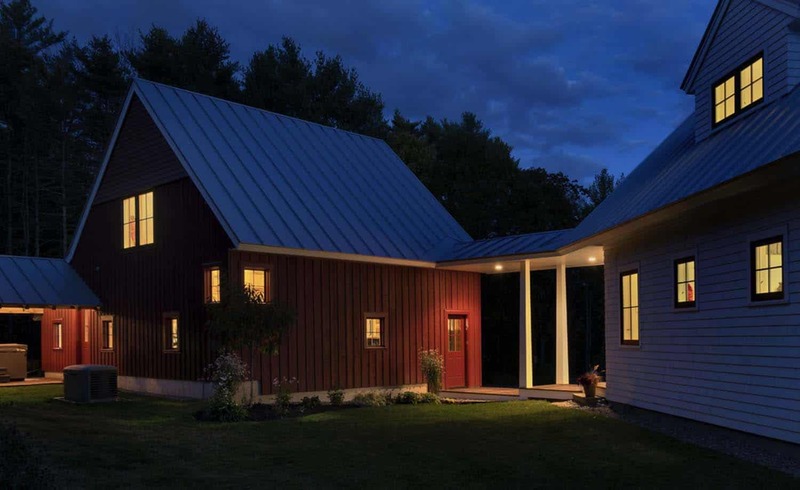 The use of sustainable features and budget-friendly materials in this cozy farmhouse is just the icing on the cake! …Readers, what do you think? 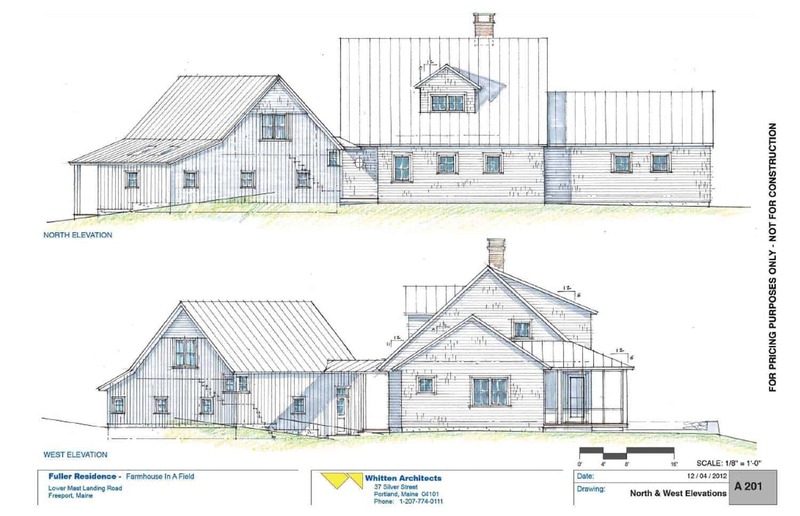 Please share your thoughts on the design of this project in the Comments! 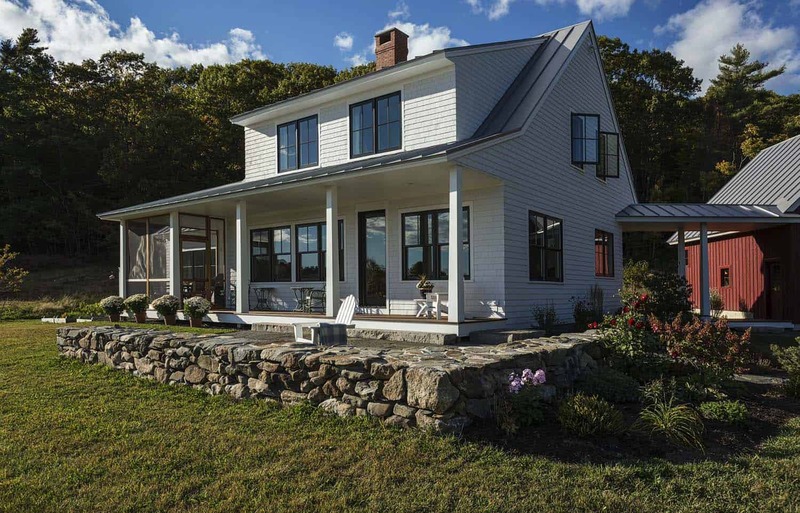 Note: Have a look at a couple of other home tours that we have featured here on One Kindesign from the portfolio of Whitten Architects: Dreamy seaside getaway on a small island off the coast of Maine and Modernized farmhouse provides camp-like refuge on Maine’s jagged coast. 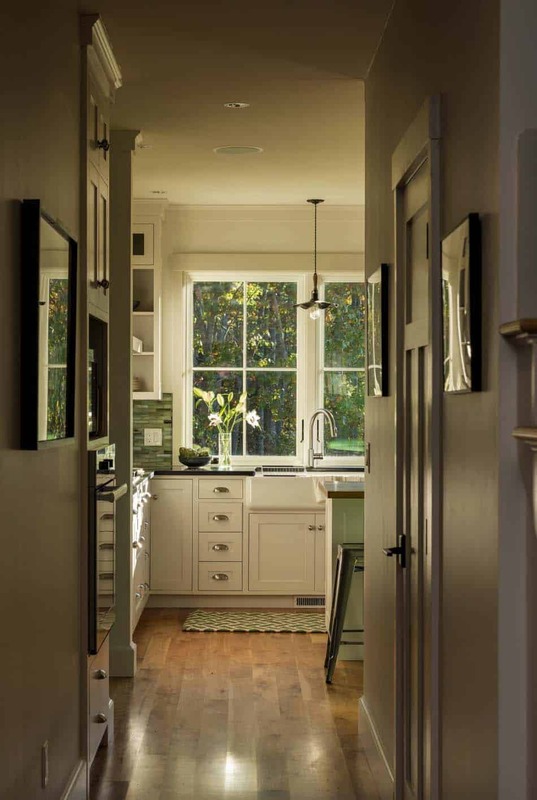 Above: The window in the kitchen is the Andersen A-Series windows — 36″ wide x 48″ tall. 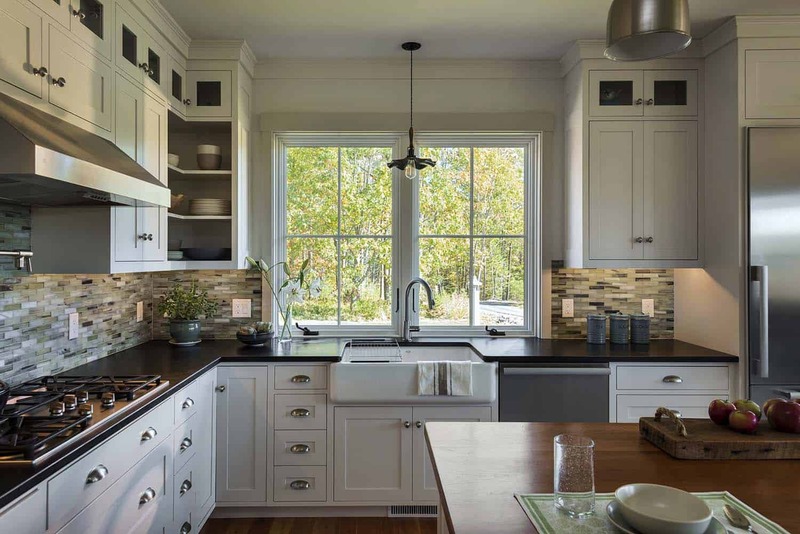 Backsplash tile was sourced from Distinctive Tile & Design. The light fixtures are from Barn Light Electric Co. and Schoolhouse Electric & Supply Co. Above: The perimeter countertops are an Italian slate, while the island is a custom build-up by the contractor using 6/4 red birch. Counter stools are the Tolix Marais A Chair from Design Within Reach. Above: The wood floors in this home are rustic red birch from AE Sampson & Son. 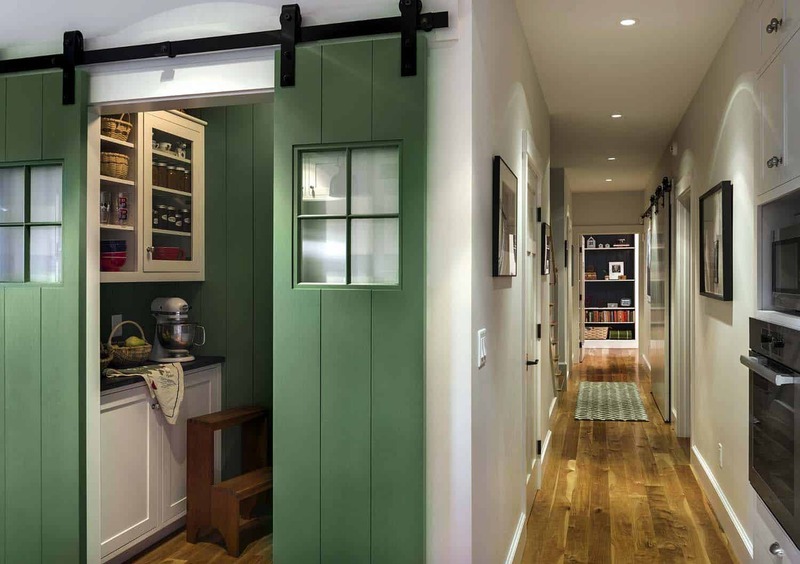 The kitchen pantry door is painted in Nurture Green SW 6451 by Sherwin Williams. 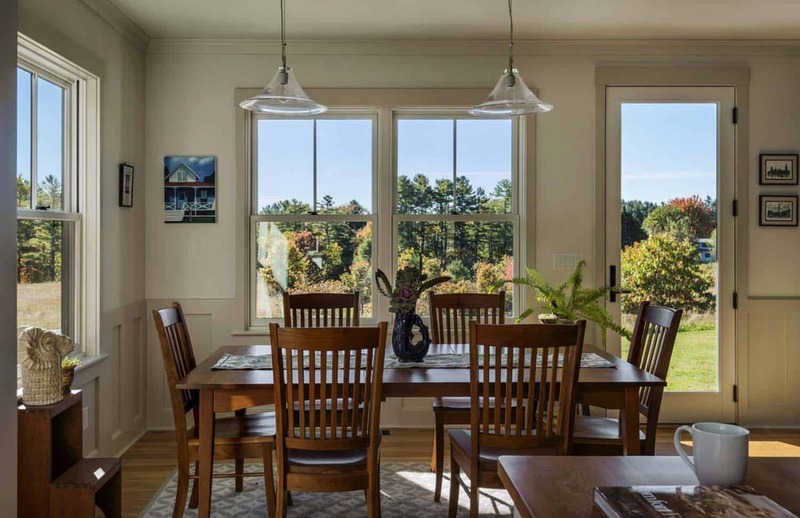 Above: In the dining room, the double-hung windows are 3′-4″ wide x 5′-4″ tall. The Hanover Pendant Lamps over the table are by Simon Pearce, while the cherry dining set is from Chilton. Above: In the living room, the fireplace surround is Honed Black Slate. 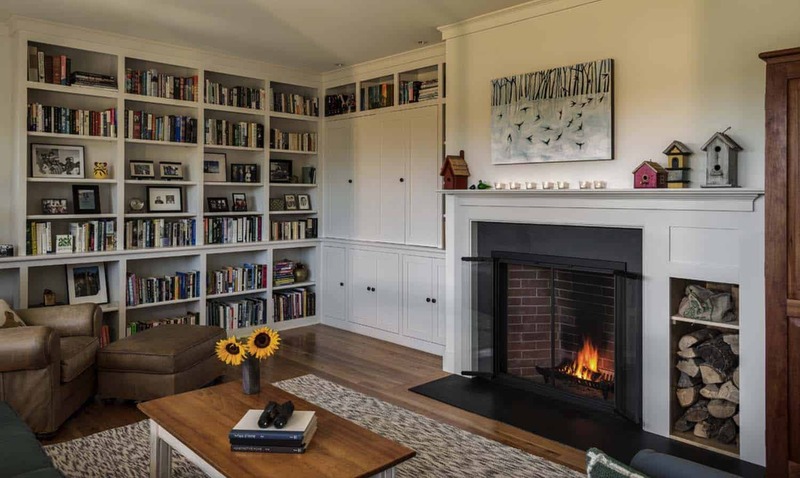 To the left of the fireplace, cabinets conceals the television. The area rug is from L.L. Bean. 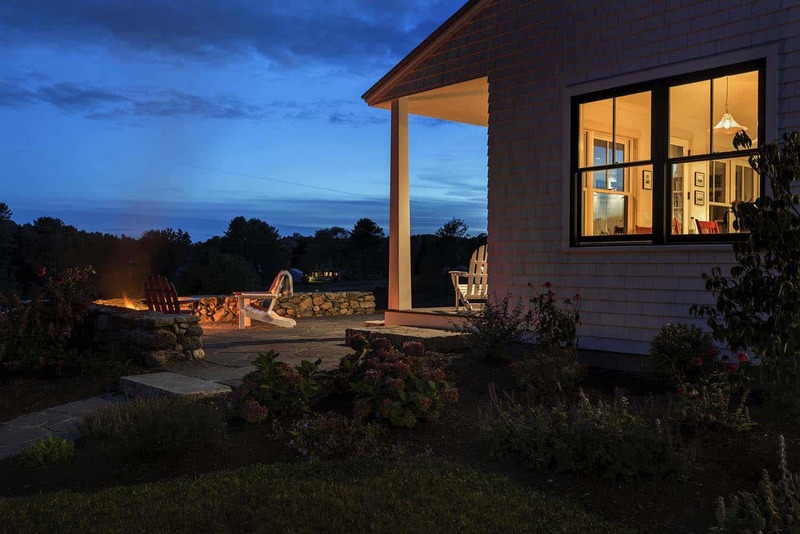 Above: The living room leads into the screened-in porch, a cozy spot to watch sunsets. 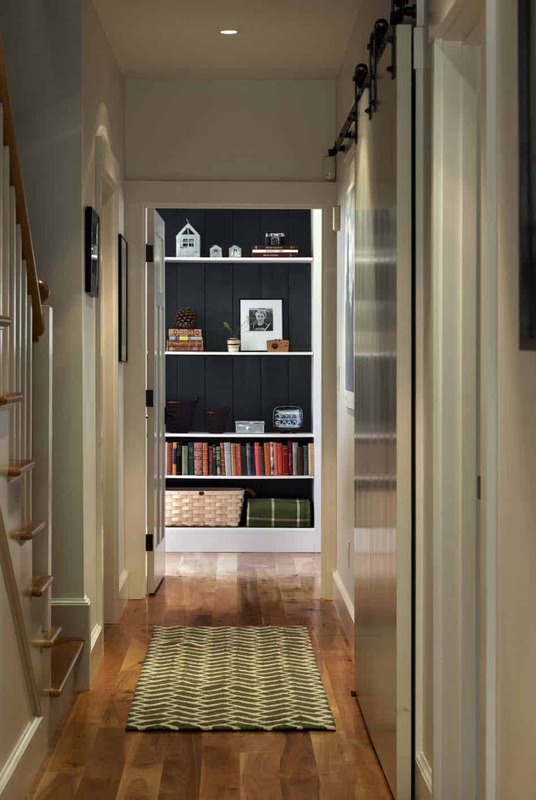 Above: A hallway leads to the master bedroom, where a painted bookshelf creates a beautiful focal point. The paint color is Mount Etna SW 7625 by Sherwin-Williams. 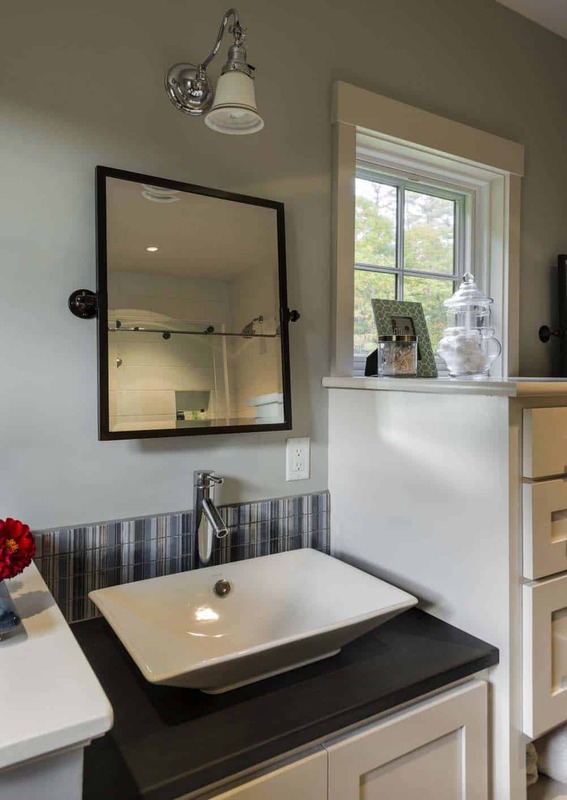 Above: In the master bathroom, the backsplash tile is from Distinctive Tile & Design. The mirror and wall sconce are from Pottery Barn. 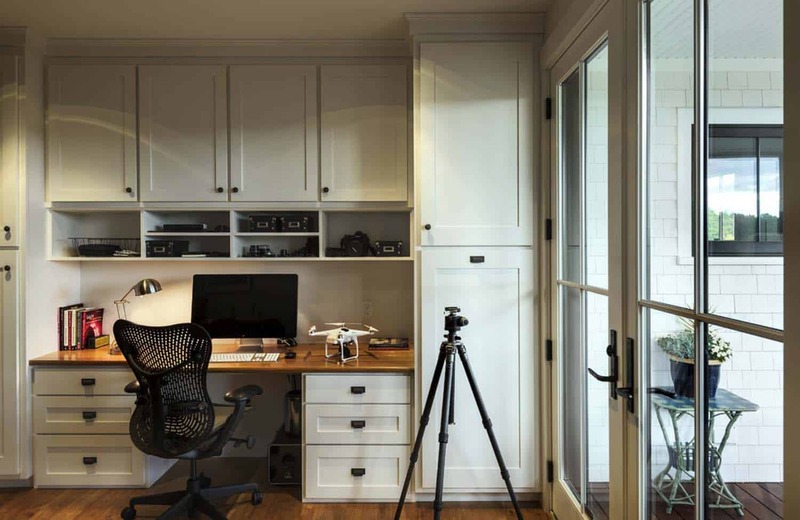 Above: The home office is located just off the master bedroom and features French doors that leads out to the porch. 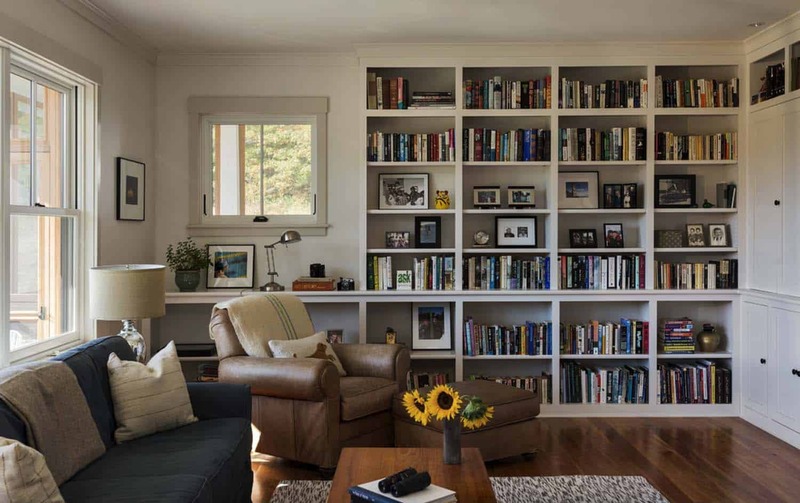 Above: A landing at the top of the staircase provides a cozy reading nook for the couple’s grown children to hang out when they visit. There are two bedrooms and a double bathroom on this level. Windows frame views of the woods. 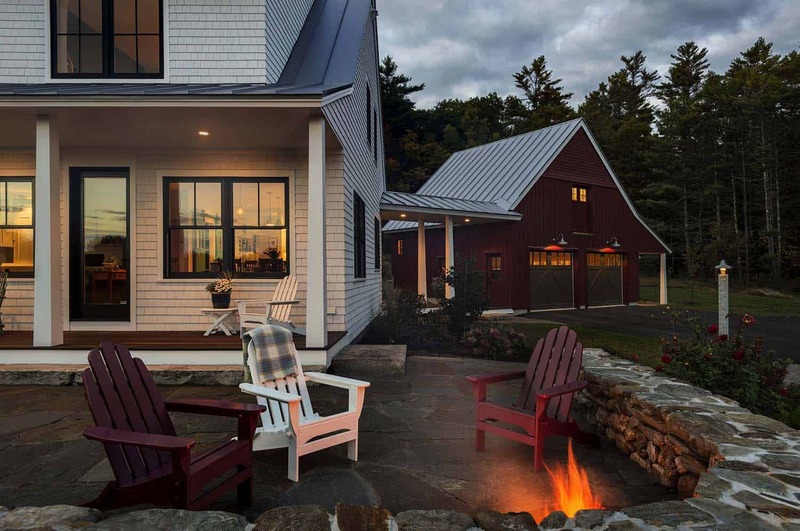 Above: The porch of this inviting farmhouse wraps the front of the house. Above: The windows are double-hung Andersen A-Series windows in their “bronze” exterior color. The porch column is nominally 7″ square at the top and 9″ square at the bottom. Above: The garage doors are semi-custom doors from Clopay. Above: The windows used in this home are the A-Series line from Andersen Windows. The exterior window finish is bronze. 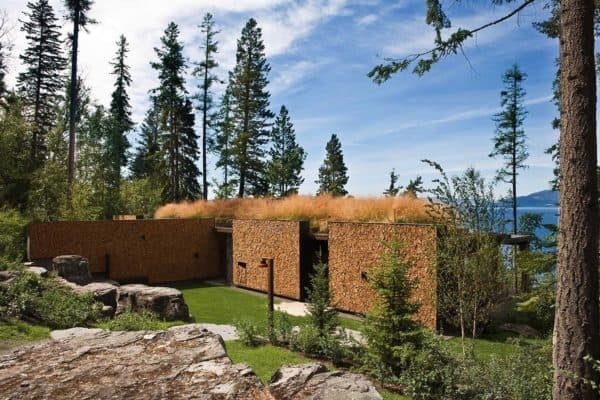 The architects employed a budget-friendly, low-maintenance materials in the design. This includes a Galvalume metal roof from Englert and pre-finished board-and-batten cedar siding. Gorgeous! 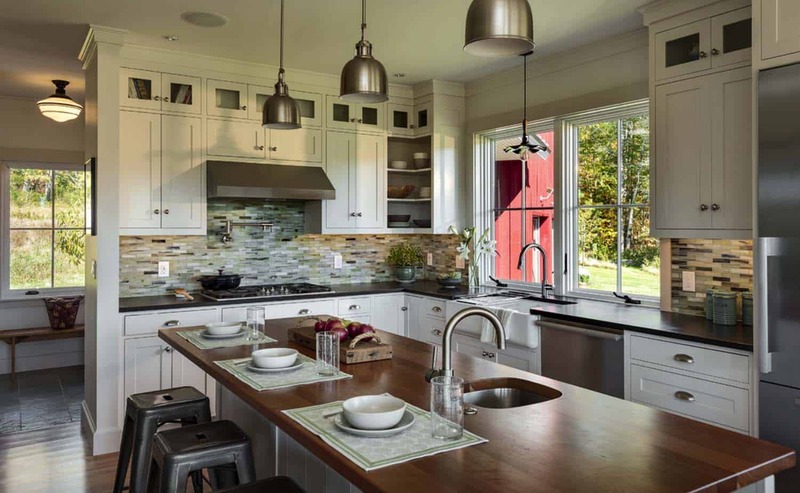 Would love to feature this farmhouse on the Barn Light Electric blog! Please contact me for info at BettyLynne@barnlight.com. Thanks!